Have you ever seen a swarm of bees and wondered what they were doing? Swarms play an important part in the life of a honeybee hive. Imagine you are a fuzzy little honeybee. You live and work in a beehive with around 60,000 sisters. That’s a lot of siblings! The hive is growing, the queen is laying eggs, and you’re all working hard to make honey. Then one day, you start to run out of room! There’s not enough room to store honey or for the queen to lay more eggs, and there’s not enough room for all of your siblings to fit inside the hive. What are you going to do? Swarm. That’s what beehives do when they run out of room. Half the hive leaves with the queen to start a new home. 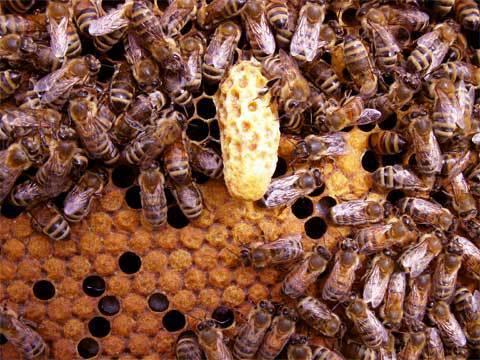 Before the swarm, you and your siblings start preparing for a new queen bee that will reign when the old queen swarms. A few days before the new queen hatches, it’s time to say goodbye to 30,000 (or half) of your siblings and get ready for your trip. Before you leave, each of you will eat as much honey as you can hold, which makes you kind of slow and not able to sting since you’re SO full. You will need that honey to make beeswax for your new home. Now you’re ready to leave. The scout bees give the signal and half of you fly out of your hive, surrounding the queen to protect her. You all circle in the air until the scouts find a good branch on a nearby tree where you gather in a big ball, continuing to surround the queen. It’s almost night time now, and soon it will be too dark to fly. You decide to spend the night on the branch. In the morning, as soon as the sun comes up, the scout bees head out to look for a new home. After a little while, the scouts return and begin excitedly doing special dances to tell everyone that they found a new home! All the bees take flight with the scouts leading the way to your new home. Your new home may be in a hollow tree, an abandoned corner of a barn, or in a beekeepers empty beehive box. 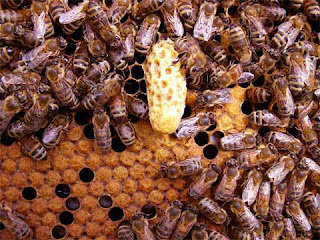 Now, you and your siblings work together collecting nectar and building comb so the queen can lay eggs. Your hive may be small right now, but someday, when this new home is full and buzzing with lots of bees and busyness, it will be time to start the swarm process all over again. But for now, you all work together to build a strong and healthy hive. Now you know what a swarm is! Just remember, you don’t have to be afraid of a swarm, because the bees are so full of honey that they can’t really sting, and they have no home to protect. You should still leave the swarm alone and stay a safe distance away. If you ever see a swarm, leave it be or call a beekeeper. You never want to kill a swarm. A beekeeper can put the bees in an empty hive box where they will start a new home and have a healthy hive.